In the summer of 1914/15, Duke Kahanamoko became Cronulla’s first surfer when he demonstrated his legendary board riding skills at North Cronulla. In 2015, Sutherland Shire’s surfing community celebrated the influence of surfing on the Shire community over the past 100 years. The celebrations are under the umbrella of Surf Retrospect Cronulla which aims to raise financial support for Surfing Sutherland Shire. Surf Retrospect 2016 will form a month long celebration of local surfing culture and history. This years title is “60 years of Progression”. It will focus on the period since the first “Malibu” style surfboards were ridden in Australia through to the present day. Surfing Sutherland Shire is excited to announce that Purnell Motors , Jaguar Land Rover, is the major sponsor for Surf Retrospect 2016. Celebrations will cover the month of October, culminating with the Sydney International in November. If you are interested in being a sponsor of Surf Retrospect please contact us for additional details. Please refer to our calendar page for dates of each event. In the summer of 1914/15, Hawaiian Olympic Swimming Champion, Duke Kahanamoko demonstrated his legendary board riding skills at North Cronulla, causing a sensation when he took on a big swell to wow the locals. Riding a board of solid wood weighing up to 50kg, local newspaper the St George Call described how Kananamoko made surfing look “ridiculously easy by standing upright, standing on his head, diving off and twisting the board” when he took to the waves on February 7, 1915. Until that time, very few had attempted to ride the waves at Cronulla on a board, rather the popularity of body surfing was on the rise leading to the establishment of the Cronulla Surf Life Saving Club in 1908 with three more surf clubs to follow in the coming years. Kahanamoko who was the world’s best known surfer at the time, captured the imagination of the thousands who witnessed his prowess and inspired many to take up the ancient Hawaiian sport of board riding. He is therefore credited with the arrival of the sport of surfing in Cronulla. 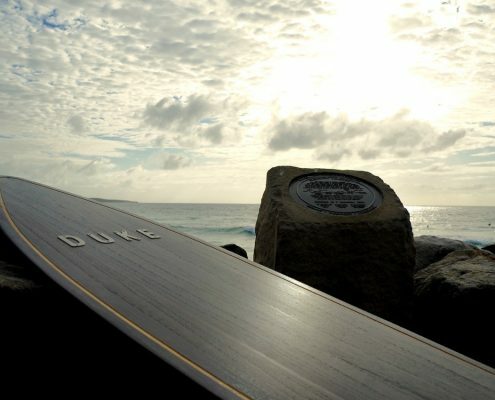 In 2015, Sutherland Shire’s surfing community and boardrider clubs commemorated the Duke’s historic visit as well as the influence of surfing on the Shire community over the past 100 years. A series of events have been held including the Centenary Surf Titles, charity dinners, a photographic exhibition, retro surfboard display, the presentation of a replica Duke surfboard and the construction of a Surfing Walk of Fame honouring local surfing champions. Another highlight of the 100 years of celebrations was the Surf Culture Dinner at Sharkies Cronulla which was a community event where the winners of the top 10 surf poll for the past 100 years were announced. Surf Retrospect is a series of celebrations which aim to celebrate our local surfing history and where possible to raise financial support for Surfing Sutherland Shire, a non-profit organisation that helps talented junior surfers to develop as professional surfers.